Green roofs are rooftops equipped to grow gardens. This innovative infrastructure offers an excellent prospect for inner city gardening. Like any garden, green roofs can achieve multiple purposes. They can grow produce, boost and attract biodiversity or create specific landscapes and aesthetic styles. But because of their location, green roofs also achieve unique additional benefits. They help to control the temperature inside a building by moderating its ambient air temperature and by creating insulation, they filter and control the release of rain water, reducing stormwater pollution, and they boost the productivity of solar panels during the warmer months of the year. Green roofs are growing in popularity, both internationally and in Australia. In the city of Toronto, they have an estimated 150,000 square metres of green roof. In Singapore there are 600,000 square metres of green roofs and walls, and in Germany, gardens cover 15% of all rooftops, with over one billion square metres of green roof. 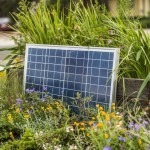 Just this week, France mandated that all new buildings must be covered with either gardens or solar panels. An inspiring step forward. In Australia, green roofs are also on the rise. Local Governments in Sydney, Melbourne and Adelaide have created guides and policies to support green infrastructure, and councils have estimated that there are over 50 green roofs in Melbourne and 80 000 square metres of green roofs and walls across Sydney. But this is not a new trend by any means. Engineers have been using rooftop soil and vegetation to protect Australian buildings from heat and fire since the nineteenth century. What has changed today is the technology. Today’s techniques reduce the cost of growing gardens on roofs and enable greater development of beautiful landscapes on a variety of building types. Rooftops make up anywhere from 10-20% of urban space, and yet go largely unused. It’s time to make a change and to restore Melbourne to its roots as a garden city. Green roofs perform their functions and achieve their objectives through ecological processes that occur naturally in gardens. The greater the variety in the garden, the richer its ecology, and the richer a garden’s ecology, the more effective its processes. Gardens containing a variety of medium to large plants provide greater insulation, visual impact, marketing value, noise reduction, biodiversity and clean air than gardens with fewer species. 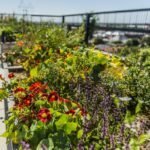 Furthermore, cultivating a richer ecology on your roof can help to lower maintenance demands in the long run, as gardens with a variety of species are more resilient and adaptive to changing conditions. By leveraging natural ecological processes, you can keep your flora and fauna flourishing. It’s good for you and good for the environment. Because of their location, green roofs can be subject to more extreme conditions than ground based vegetation. 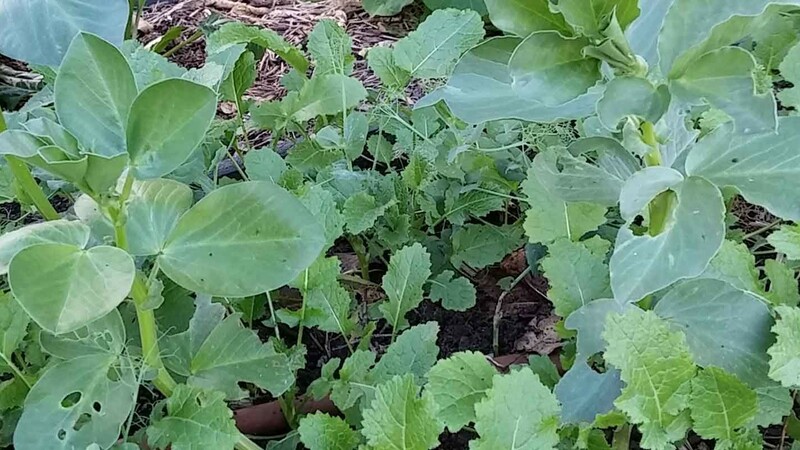 Depending on the height and location of a building they may receive strong winds and changing shade and solar conditions, and it is important to be aware of these conditions when selecting plants for a green roof. It is also important to consider what the primary purpose of your green roof is and what benefits you want from it, so that you can choose your plants and garden design to achieve these. If you want to grow produce on your roof, you may require a deeper substrate layer, which will require more weight bearing capacity. You will also need to have access to your roof so that you may plant and harvest as required. ● What is its weight loading capacity of my roof? ● What are the benefits and purpose I want to achieve? ● How often do I want access to the roof? ● How often do I want to maintain it? ● What are the current conditions on the roof (wind, solar, shade)? ● What species do I want to plant and what size will these grow to? 4. Substrate or growing medium which provides plants’ three basic needs: water, nutrients and oxygen. 5. Plants. As we become more urbanised, it is important that we use our spaces and resources wisely. The backyard may be shrinking, but there are opportunities right above us. Pip Hildebrand is a green roof consultant at Do it on the Roof, delivering research and communication and managing the Plants & Panels incursion program. 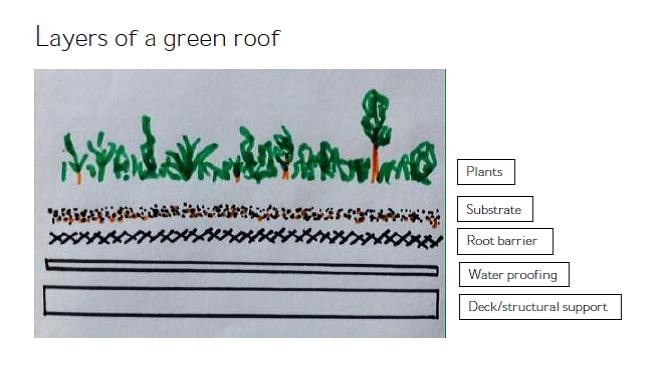 Do it on the Roof is a new green roof business which designs, creates and manages gardens on roofs and walls and will shortly launch a course the “Fundamental Principles of Green Roof Management”.